Many of these pendant are one of a kind pendants. We use natural stone, so we cannot exactly reproduce the colors, textures, and shapes with much reliability. We strive to keep this list up to date, however sometimes we the pendant and cannot immediately remove said item. So we cannot promise the availability of the exact pendant. Contact us, if we can we will make a similar piece, depending on the stock of gemstone we currently have or can secure from our suppliers. We usually wrap our Pendants in Brass, Copper and Sterling Silver. We can wrap in other metals upon request. Each Pendant is wrapped in a way to make them easily added to an existing chain or Necklace, and do come with a Necklace for immediate wear. Most of these pendants are also wrapped in a way that they can be worn with either side showing, giving the advantage of adding additional looks with the same pendant. Many individual pendants and sections will refer you to the Facts, Lore and Tidbits section of the website for amplifying information. Click to button below to open the page. Metaphysically speaking Silver is a great metal for healers. Silver is considered to have a gentle, cool, smoothing energy. The belief is it can remove negative energy from the body and channel the positive energy of other gemstones or crystals into the patient. We use Argentium Stirling Silver to add value and help keep tarnish at bay. Argentium Sterling silver is as pure as regular Stirling Silver, however, the addition of Argentium to the silver creates a layer of atoms that resists tarnish. We have a selection of these natural fossils we work with. they are called Ammonites. These creatures lived in the seas between 240 - 65 million years ago, when they became extinct along with the dinosaurs. The name 'Ammonite' originates from the Greek Ram-horned god called Ammon. Ammonites belong to a group of predators known as cephalopods, which includes their living relatives the octopus, squid, cuttlefish and nautilus. This Ammonites is hand wrapped in Sterling Silver to show off the natural spiral as much as possible and to enhance the flow of energy as much as possible. We are able to have multiple pendants of this style, although as they were once living creatures, no two will be exactly alike. We can sometimes get a pair, as each side would be cut from the same fossil. ​ Ammonites are a very powerful earth healing fossil. The Ammonites draw off negative energy. Think of the Ammonites as a filter, drawing in the dense energies which are no longer needed, moving them through the spirals and releasing them as positive life force energy. More details on metaphysical properties of this fossil are in the Facts, Lore and Tidbits section of the website. This is a Semi-precious gemstone called an Agate. We selected a series of Agate slices to bring the natural wonder and beauty of these unique gems stones to our customers. We wrapped this gemstone in beautiful Argentium sterling silver for reasons metaphysical and ascetic. Agate is a great gemstone for Protection, Healing and Strength. Different colors of Agate are stronger in different areas but all agates have properties in common. Historically, Agate was placed on Breastplates to protect them in battle and give them strength. Agate gives courage, emotional strength, self-confidence, and dispels fears. It is also noted as a very protective stone for children, especially with regards to falling. These protective qualities have made Agate a good luck stone. ​More details on metaphysical properties of this gemstone are in the Facts, Lore and Tidbits section of the website. We are able to have multiple pendants of this style, although as they are natural stones, no two will be exactly alike. Likewise we can wrap additional stones in the same style, no two wraps would be exactly the same. This Ammonites is hand wrapped in Brass to show off the natural spiral as much as possible and to enhance the flow of energy as much as possible. We are able to have multiple pendants of this style, although as they were once living creatures, no two will be exactly alike. We can sometimes get a pair, as each side would be cut from the same fossil. Ammonites are a very powerful earth healing fossil. The Ammonites draw off negative energy. Think of the Ammonites as a filter, drawing in the dense energies which are no longer needed, moving them through the spirals and releasing them as positive life force energy. More details on metaphysical properties of this fossil are in the Facts, Lore and Tidbits section of the website. This is a Semi-precious gemstone called an Agate. 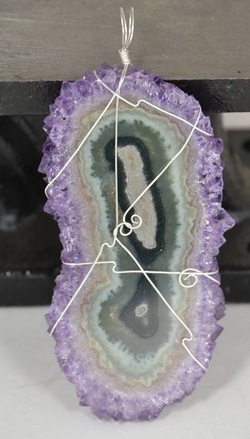 We selected a series of Agate slices to bring the natural wonder and beauty of these unique gems stones to our customers. We wrapped this gemstone in stunning Brass for reasons metaphysical and ascetic. ​We are able to have multiple pendants of this style, although as they are natural stones, no two will be exactly alike. Likewise we can wrap additional stones in the same style, no two wraps would be exactly the same. We at Nightwisp Designs love to work with copper. We love it’s feel, it’s shine, it’s look and it’s work-ability. However if those reasons were not enough, copper has a long history of healing use and other more metaphysical uses. We have a much more detailed list of the Metaphysical Properties of copper in our Facts, Lore and Tidbits Section. This Ammonites is hand wrapped in Copper to show off the natural spiral as much as possible and to enhance the flow of energy as much as possible. We are able to have multiple pendants of this style, although as they were once living creatures, no two will be exactly alike. We can sometimes get a pair, as each side would be cut from the same fossil.